I have worked with Desert Valley Contracting on several occasions and my experience with them has always exceeded my expectations. Every team member has been responsive and eager to aid State Farm’s policy holders in their time of need. They work quickly, efficiently and take the time to explain the construction process to their customers while keeping our agency updated on the job progress. DVC’s communication with us and the client is impeccable, as they understand that on every job they are a representative of State Farm and their reputation. All of their work is done in house which keeps the costs to clients down and allows them to have control over scheduling and job timelines, resulting in quicker turn around. I would highly recommend Desert Valley Contracting. Their 25+ years in the Las Vegas market is a testament to their passion of helping people, their standing in the construction community and success as service focused organization. Birtcher Anderson recently had a water damage which needed immediate remediation. A call to Servpro of Downtown – Las Vegas was made and within several minutes we knew the time of arrival and who would be on-site from Servpro to help. The crew came and immediately started the remediation while their business development employee explained the process and what was going to be done to mitigate the damages. Throughout the process their project manager kept in constant touch with us to let us know what was happening. They answered our calls and emails immediately and helped us deal with the situation. Their crew on-site was professional and friendly. They answered our questions and explained to us what they were doing. They moved their equipment in and out with no problems and the job was completed within a few days. We would recommend that anyone needing their type of service should call Servpro of Downtown – Las Vegas. You will receive a professional and knowledgeable team that is dedicated to solving your property emergencies. Birtcher Anderson Realty Management, Inc. I have been a member of the property management community here in Las Vegas for over 15 years. Throughout my extensive career in property management, I have worked with many restoration companies. Unfortunately, the experience that I’ve had has not always been positive. Many restoration companies create a number of concerns that regrettably affect us as clients such as, poor workmanship, untimely completion and lack of sustained cash flow to pay employees. Feeling a sense of frustration I was referred to Servpro of Downtown – Las Vegas as a hopeful means of providing quality service. Initially I was hesitant as the experiences I’ve had previously made me overly cautious in regards to restoration companies. I am pleased to say that not only did Servpro of Downtown Las Vegas meet my expectations, but highly exceeded them. Their timely response, all-encompassing expertise and desire to go above and beyond for each client no matter the size of the loss surpasses any other company in Las Vegas. Ultimately, these factors contribute to the recommencement of our tenants business which is vital during these turbulent economic times. Throughout my experience with Servpro of Downtown – Las Vegas, they have treated their clients with the highest level of professionalism and courtesy, taking the approach of viewing the properties from a position of pride of ownership as opposed to just another job. By utilizing this perspective they are able to empathize with both the client and tenant given any disaster situation that may arise. 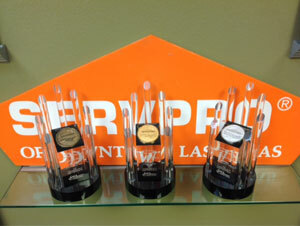 In closing, I highly recommend Servpro of Downtown – Las Vegas for all of your restoration needs. I have been working with Desert Valley Contracting and Servpro of Downtown Las Vegas for a while now and both companies are very attentive to detail and are a pleasure to work with. Whenever I have an issue I can call both companies and they address the issues quickly and very professionally. I just wanted to let you know that I am very pleased with professionalism, honesty and courtesy of everyone involved in our project. Daniel’s personality got you our job and Rudy’s courtesy and professionalism won our trust in your company. It has been a Great experience. I can assure you that I will recommend your company to anyone without hesitation. Thanks to all of your crew who worked on our house. My sincere thanks goes to your crew and yourself for coordinating my kitchen restoration after water damage from a failed dishwasher. The kitchen came out beautifully and looks as though the damage ever happened. It was a pleasure working with everyone at Desert Valley Contracting. The workers did an amazing job !!! Looks like they where never here. I’m so happy with the stress free your company provided me .. The job was finished today to my satisfaction. I would like to say that Renee handled everything very professional and nice guy. Also all the guys that worked in my house was very professionals and very nice people. I would hire them anytime and will recommend this company to anybody that will ask me. So thank you very much!